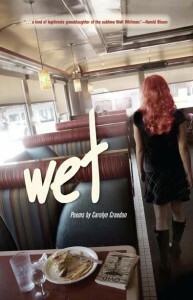 Carolyn Creedon is a writer, editor, and fifteen-year veteran of the waitress wars. She completed the Ada Comstock program at Smith College, went on to earn an M.A., then to UVa where she earned an M.F.A. and was the recipient of the Academy of American Poets Prize. Her poems have been published in the Massachusetts Review, Best New Poets, Best of the Best American Poets, Ploughshares, Yale Review, Rattle, American Poetry Review, and other journals. In 2010 she won the Alehouse Happy Hour Poetry Prize. She lives in Charlottesville with her husband and her dog.